Photo courtesy of The Maine Lobster Festival. The 2018 Maine Lobster Festival Schedule is five days of full-on lobster feasting along with lobster crate races, a lobster cooking contest, the coronation of Maine’s annual ‘Sea Goddess and more. All of this is in celebration of the Maine lobster season, when Maine’s delicious, new shell lobster is cheap and plentiful. The world’s largest lobster fest takes place the first weekend in August each summer in the coastal town of Rockland, Maine. 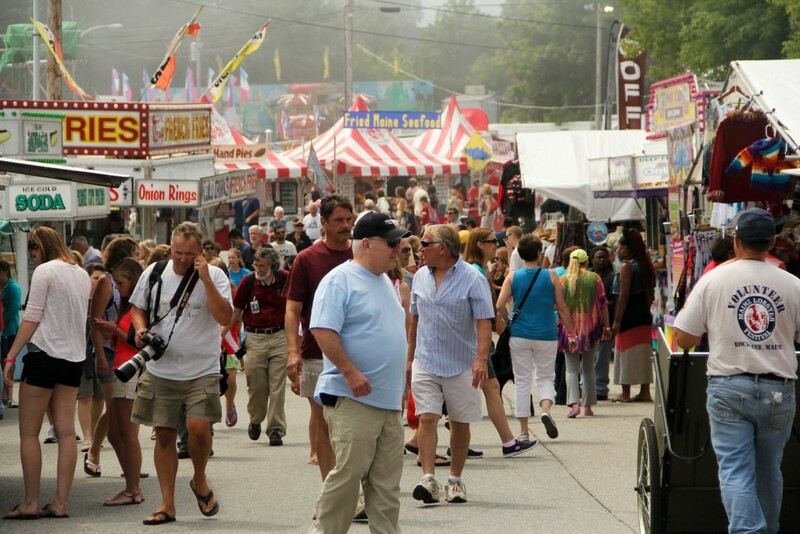 This year, The Maine lobster festival runs from the 1st to the 5th of August. Visitors can look forward to daily lobster dinners and other lobster specialties – such as lobster mac and cheese, lobster bisque, lobster stuffed risotto balls and lobster won-tons. Below are highlights of the Maine Lobster Fest schedule, including the dates and times of the parade, crate races, road race, lobster dinners and more. 12:00 p.m. – Festival opens with the arrival of King Neptune and his court and the opening ceremonies. The vendors and carnival rides will all open and the lobster serving kicks off at this time . 8:00 – 10:00pm – The 71st Maine Sea Goddess Coronation takes place on the Main Stage. 7:00 – 10:00 a.m. – All-you-can-eat pancake breakfast in the Food Tent. The pancake breakfast costs $6 for adults and $3 for children. 10:00 a.m. – 4:00 p.m. – Tours of the US Coast Guard Base at 54 Tillson Ave.
11:00 a.m. – Lobster dinner serving begins at the Eating Tent. The lobster dinner includes fresh, steamed lobster, a dinner roll and corn on the cob. Lobster bisque and lobster mac-n-cheese is also on offer. Lobster rolls, lobster wraps and lobster Caesar salad will also be sold at the Lobster Cafe. The price of the 2017 Maine lobster festival lobster dinner was $17 for a single lobster, $33 for a twin lobster dinner and $31 for a Maine shore dinner (one lobster, steamed clams, corn on the cob and cole slaw). 2018 prices are still TBD. 4:30 – 7:30 p.m. – Steins and Vines Tasting Event showcasing Maine brewers and vintners. There is also live music throughout the day. 1:00 p.m.– Cooking demonstration with Chris Oliver. Learn how to make his award winning seafood chowder. 11:00 a.m. – Lobster dinner serving begins at the Eating Tent. There is always music and other entertainment throughout the day. 10:00 a.m. – The Big Parade takes place along Main Street. 12:30 a.m. – Maine Cabin Masters will be at North Entertainment. There is a variety of live music throughout the afternoon as well as a pre-registration for the running race. Sunday is family fun day, with free admission and lots of kids activities. 8:00 a.m. – 1 Mile kids fun run takes place near the main gate. (the 10K road race usually kicks off at 8:30am near the main gate but the official time has yet to be posted). 11:30 a.m. – Cod Fish carry and lobster eating contest will take place at the main stage. 12:30 a.m. – The Little Lobster Diaper Derby will take place at the main stage. 2:00 p.m. – The lobster crate race begins at the waterfront. Registration for the crate races is at 7am at the information tent. 5:00 p.m. – The Maine Lobster Festival typically draws to a close with a wreath laying ceremony for fishermen lost at sea takes place at the public pier. For information on other Maine seafood festivals, click here. I wanna go. Where can I stay? Try Trade Winds or 250 Main Hotel. They are in spitting distance of the festival. The Rockland Harbor Hotel is another option within walking distance. Enjoy the Maine Lobster Festival! Any hints on close lodging so that everthi g is accessible by foot?? We have been wanting to do this for years! !